Fate/stay night is an anime that chronicles a two-week period in the life of an amateur magus who attends a school in Japan. 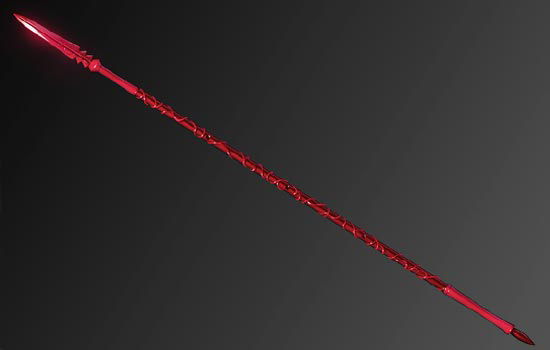 I was commissioned to build Gáe Bulg, Lancer’s spear from the anime Fate/Stay Night. I started by lathing the head and tail shafts out of a single piece of basswood. Since the tail spike would be coming in contact with the ground and basswood is soft, I made the spike out of oak. The spike is glued into a hole in the base of the tail piece. I cut out the blade and glued it into a notch in the head piece. The seam was puttied smooth. 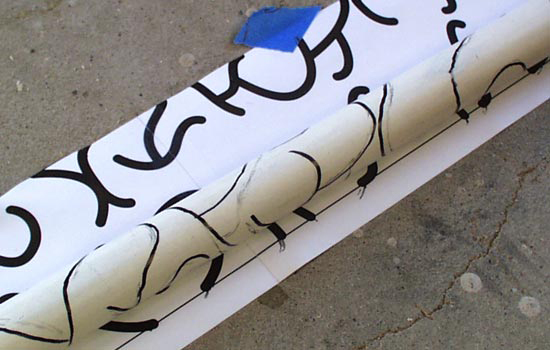 A central spine for each side was formed from a 1/4″ wood dowel. It was sharpened to a point on the belt sander and then split in half. Decorative discs were cut out of styrene and glued to the sides of the blade. 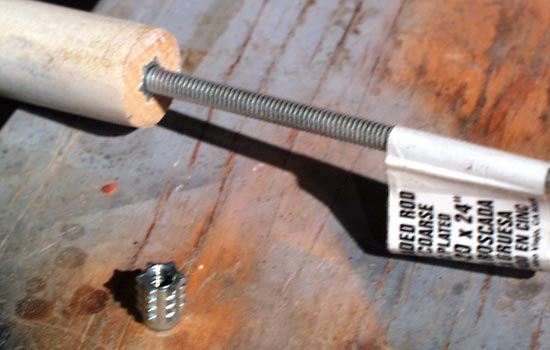 I drilled each end of the main shaft dowel and fit thread inserts. 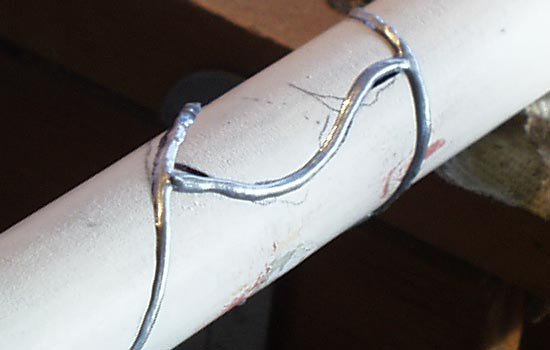 This will allow a 1/4″ threaded rod to screw the head and tail pieces to the spear shaft. I printed out a template for the shaft markings and transferred them to the dowel with carbon paper. I traced over the pencil with a Sharpie, correcting areas that didn’t look right. 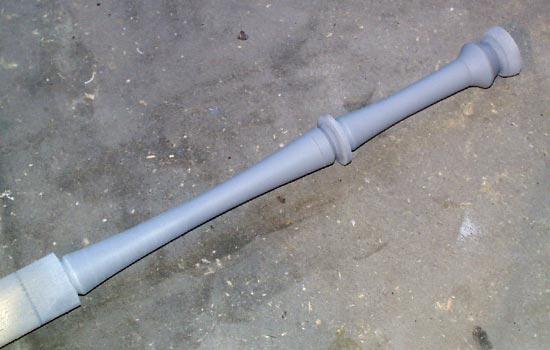 I used puffy paint to apply the design to the shaft. The shaft has three circles on each side of the shaft.. I drilled out a hole and then glued a plastic disc to each. All parts received a base coat of metallic silver and then a top coat of metallic red automotive paint. The head and tail pieces painted. The parts disassemble for shipping. 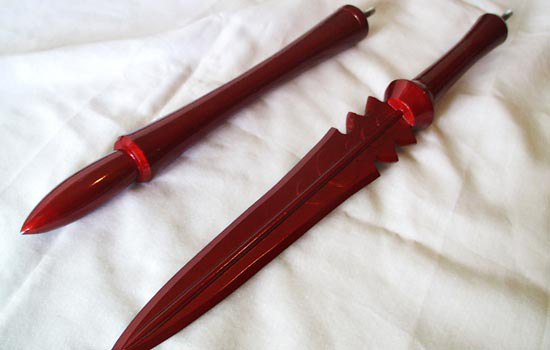 The assembled spear is over six feet long.